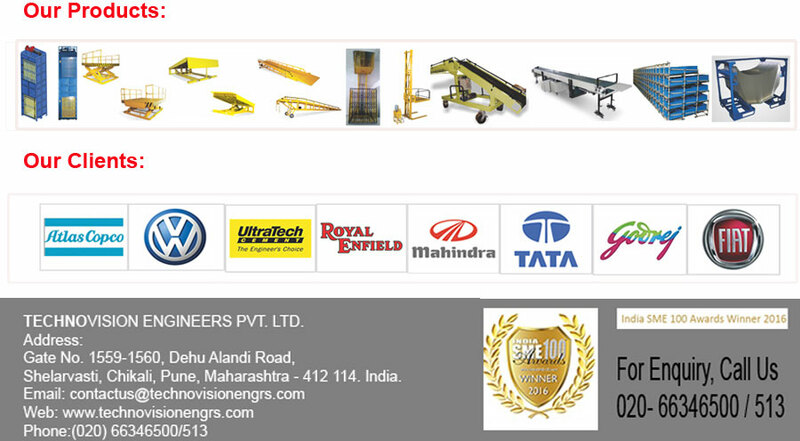 TEPL is one of the leading manufacturer of Material Handing Equipments. The core focus of the company lies in superior quality and excellent customer service. With expertise in the industry and constant innovation in the industry, the company also undertakes turnkey projects with design, manufacturing, supply, erection and commissioning activities. The company is one of the front runners in Lean Manufacturing Solutions in India with an ISO 9001-2008 certifition. The production house has the capability to conduct in- house R & D and the company possesses exceptional talent for designing in terms of manpower, knowledge and technology. The company owns two manufacturing set-ups and total area of 28000 sq. ft. with all manufacturing and design equipments. TEPL known to deliver state of the art contemporary designs with their range of material handling equipments. Delivering the best in class solutions that add value to our clients' business, being the industry leader tnisted by prestigious brands and evolving continually to exceed customer expectations. Following business ethi and keeping our integrity, creating environment and good work culture for our employees to grow and perform beﬂer.Striving to make our products impeccable so that they give our customers good return on investment.